This interview took place on: July, 2017. 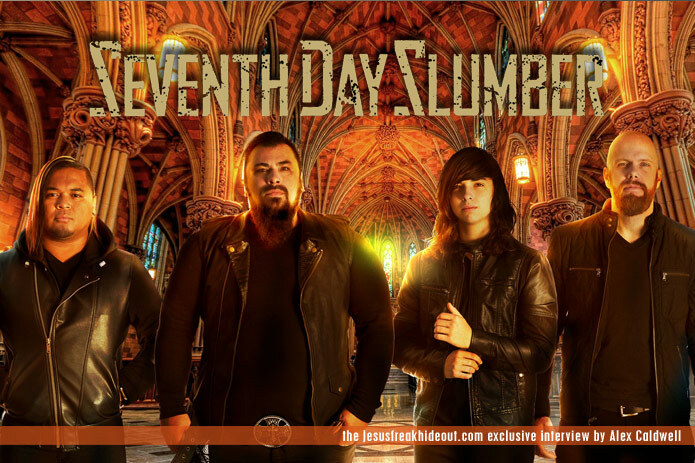 Click here for Seventh Day Slumber's Artist Profile page. JFH (Alex Caldwell): Hi Joseph, where are you calling from today? Joseph Rojas: I'm in Texas right now. It's where we got our start, so it's kind of a 'home turf' for us. JFH (Alex): Speaking of "starting out", I saw you guys back in 2002 at a festival when I was a young youth pastor. Someone in my group bought your album Matthew 5, and we played that thing in the youth group van for months after that. You guys were great in talking to my kids on a personal level, and even, I think, letting some of them hang out with you in your bus, or van or whatever you guys were driving at the time. Thanks for taking the time for them. I also remember listening to "Out Of Time" over and over again, and hearing the van's speakers groan with the load of the bass part. Joseph: *laughter* Oh man, I remember those days. Thanks for the support all these years. Yeah, we love hanging with kids. It's what God's called us to do. It's what it's all about. JFH (Alex): Just for our readers' sake, could you walk us through your history as a band? Joseph: Sure thing. Well, I got saved out of a pretty [significant] drug habit that I had, and I immediately wanted to tell others about Jesus. I went to a small Bible college and started to grow as a believer. JFH (Alex): Is that where you started writing songs? Joseph: Yes, but it wasn't to have a rock and roll career. I just wanted to tell people about what Jesus had done in my life, you know? The songs were just organic, just telling people my story. But, soon enough, I found some guys to play with and we recorded an album for a Black Gospel label in Texas. JFH (Alex): A Gospel music label? That's a pretty far distance from hard rock. Joseph: Yeah, it was a wacky thing. But that label was great. That first album (Freedom From Human Regulations) came out on my wedding day, and representatives of the label brought copies to my wedding. Joseph: Yeah, it was a trip alright. We've been going strong since then. We signed with a label called Crown Records for one release, and then with BEC Recordings for a bunch of albums after that. We're still going today, hitting the road hard with the City Rockfest Tour with great bands like Decyfer Down, just going out and rocking for Jesus. JFH (Alex): Since I'm a long time fan, it's great to be able to tell you a story about how a song of yours influenced something in my life. Joseph: Go ahead man. I love it. JFH (Alex): When I heard "Caroline" from your first BEC album (2005's Once Upon A Shattered Life), I loved it immediately, and I knew there was something about it that was speaking to me, but I couldn't quite place what I liked about it, what spoke to me. I read an interview of yours at that time, and you mentioned that the Caroline of the song was your mother-in-law, and you wrote it for her. Well, I had just gotten married a short time before, and I was struggling with my mother-in-law at the time. That song sparked a thought in me that I didn't really see my mother-in-law as a person with a story, just someone I was struggling with at the moment. In letting the spirit work through your words, I was convicted that I needed to have more patience with her, and listen to her story before "passing judgment", if you know what I mean. Today, we have an awesome relationship, but it took a lot of time. But thank you for writing that song. It really helped me to see something that I was blind to at the time. Joseph: That's awesome! Thanks for sharing that man. That's why we do what we do. JFH (Alex): Now this is a bit more of a tough subject, but what kind of changes have you seen in the music industry since you guys started out? Joseph: Well, that's the conversation of the moment, isn't it? Something that comes to mind immediately is the radio. When we were first starting out, a hard rock band could get a song on Christian radio. It would mostly be one of your mellow ones, but it was doable. Our song "Oceans From The Rain" (from Once Upon A Shattered Life) was a big song for us, and Christian radio really embraced it, and gave us a platform for our ministry and for our harder stuff to get heard. But it's so much different now, and getting a song on there is a huge struggle. Music has changed, there's no doubt about it. Playlists have shrunk a bit. It's a very specific sound that's played. JFH (Alex): I hear that same thing is true in the secular market as well, anything that has a "band" element to it is held at a distance, and well-known artists can't crack the top 40, when they previously could. Joseph: That's why the road, and touring, is so important. We founded the City Rockfest Tour to give a platform to bands that have had other doors closed to them, and to reach the kids out there who still like to rock. It's paying the bills right now, and enabling us to feed our families, and it's been a blessing. Bands like Decyfer Down, Disciple, and Spoken, we're a brotherhood and we're out to save Christian Rock! Someone's got to do it! JFH (Alex): *Laughing* Are you going to be the "last band standing?" Joseph: You know it! We made our new album Found with our own money, and we're promoting it hard by touring, talking to anyone who'll talk to us. I understand the whole Kickstarter thing, and lots of great bands and artists do well with that process, but I want our fans and rock fans in general to know that we believe it what we're doing enough to put ourselves on the line for it. We're featured on the City Rockfest Tour not because we own and run it, but because Seventh Day Slumber adds value to the tour. We have fans come out every night, and there's real, down and dirty ministry happening. Kids are out there, dying of overdoses and suicide. The hopelessness is real, and the Lord's put us out there on the front lines. JFH (Alex): Amen! Do you feel like this is a new blueprint for what bands can do going forward? Joseph: Oh yeah. We're banding together out here, supporting each other, encouraging each other, just locking arms in ministry. JFH (Alex): Your son is playing drums with you. How has that been as a family? Joseph: It's awesome. He's just been into drums and rhythm since he was born, and he's been playing with us for a few years now. Having the family out with me is a way to stay connected with them. JFH (Alex): You've talked a lot about fatherlessness over the years, how it's affected you. Do you feel the pressure to 'do it right', to be the best father you can be? Joseph: Oh yeah. But there is also the knowledge that God is the best father, and I'm just doing my best. I get tired and grumpy out on the road. But I hope and trust that my family sees God through me, even on the rough days. JFH (Alex): With all the change that you guys have encountered, do you ever get tempted to get angry with how much things have shifted? Joseph: Oh yeah, but the Lord has helped me work through a lot of that in the last few years. You can't stay angry or frustrated, it comes out on those close to you. I've moved through it and have come out in a more content place. God has a plan, and I want to be part of it. Peace inside is good. I pray for wisdom every day, and the Lord has been faithful to provide it. JFH (Alex): Lastly, how would you describe your new album, Found? Joseph: Well, it's a mix of the old school rock stuff that got us 'on the map', so to speak, and some of the worship elements that we had in the last few years. We're proud of it, and it's a good representation of what we've done since the beginning. It's a mix, and we're thrilled with how it turned out. JFH (Alex): Thanks for all the years of ministry, seriously. And thanks for loving on my youth group kids all those years ago. Joseph: Thanks dude, it's our pleasure. To God be all the glory. Seventh Day Slumber's latest album, Found is available now wherever music is sold!